MaNishtana | "A Song Every Day"
Posted on August 11, 2016 by vspatz	in Baba Metzia, Ethics, guarding the tongue, racism, Yebamot and tagged Be'chol Lashon, Bernie Sanders, Jewish Daily Forward, MaNishtana, Michael Twitty, Vanessa Hidary. 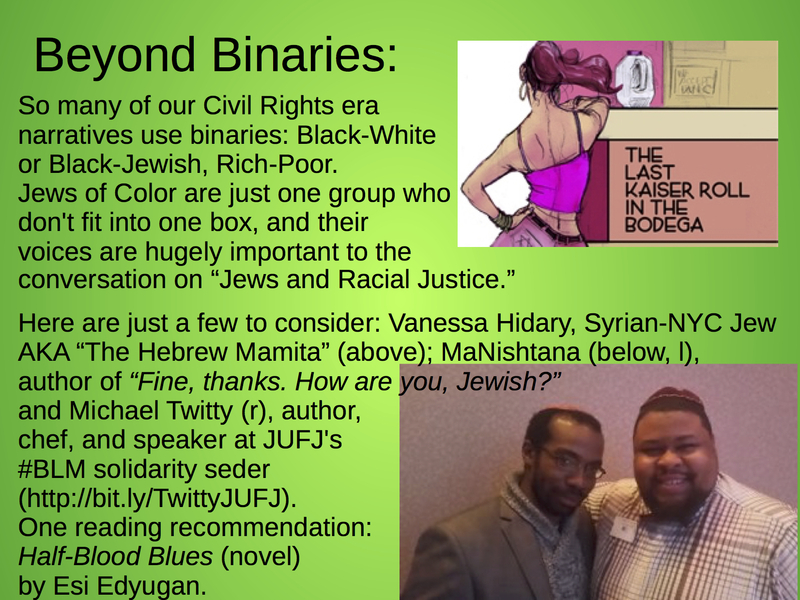 further thoughts and references on Jews and Racial Justice…. “Bernie Sanders Looks Like Everyone’s Jewish Grandpa…,” read a headline on the Jewish Daily Forward website earlier this election season. But Sanders doesn’t look anything like these Jewish men, some of whom are probably grandpas, or like many Sephardic grandpas. He doesn’t look like the grandparents of many Jewish children in the United States. Bernie Sanders looks like Jewish grandpas from only one part of the world. The blurb was meant to be cute, sure, but it still promotes an extremely limited view of who “looks Jewish.” (Sadly, the Forward lets the same sloppy “Jewish looks” idea inform news stories as well.) This, in turn, helps validate widespread challenging of anyone who doesn’t look like “a Jew” Central Casting might send. Jews of color, in particular, report being frequently singled out and questioned about their background — despite that fact that this is contrary to a number of Jewish teachings. in the area of racial justice. Not all Jews of color are Jews by choice. But the Talmud’s specific stress on not embarrassing a proselyte or child of a proselyte (Baba Metzia 58b) seems apropos. As does Jewish law forbidding differentiating between Jews by choice and Jews by blood (see, e.g., Yebamot 47b). It is sometimes argued that people are “merely curious” and not attempting to shame a person who looks “different.” But this ignores what Jews of color, and others who don’t necessarily resemble Ashkenazi Jews, have repeatedly said: Being harassed with demands to explain yourself and your connection to Judaism is not welcoming; it is exhausting to be singled out all the time and demoralizing to have one’s identity challenged. MaNishtana, “100% Black, 100% Jewish, 0% Safe,” has his identity challenged so often, he says, that he finally penned a book entitled Fine, thanks. How Are You, Jewish? or act like your people. Impossible. Because you are your people. You just tell them they don’t look. period. One organization that has been working for years to “foster an expanding Jewish community that embraces its differences,” is Be’chol Lashon: In Every Tongue. Among their offerings are research, resources, and diversity-celebrating materials.